This is funny because yesterday I wanted to write that it was so sweet when the dummy fell out of her mouth as she fell asleep but I had no idea what it was called. Now I know it’s a MINNA!!! I have a 3yrs and 4months daughter. She’s in dummy until two days ago. She calls it “achi” from pacifier word to paci to achi. Lol. Anyway, she had that since about 3-4months. Same reasons with u. At around your daughter’s age it’s hard to take it out so I said to myself to delay it and ignore what everybody’s saying. She had her dental check up overseas. She has perfect set of teeth. Maybe because her first tooth errupted 16months. I had to bribe her just days ago. That the mall is going to let her have tri-scooter which she has been wanting. I gave her toy bucket and let her put all her “achi”. So she did. And yes, she got heaps. She needs 3 dummies every now and then. As besides sucking it she developed her passion of also having each hand dummy. haha Steffany, my daughter likes to have a dummy in each hand too! And she likes to hold one while she sleeps, even when there is also one in her mouth. Strange little habits! I’ve no idea how it will go when she’s older but I guess I’ll just deal with it as it comes. Seth called his Minna too! The words above are like they came out of my own mouth as I felt the same way and he ended up with one too. We are at the end of the weaning process now and it isn’t as bad as I thought it would be ( we cut the tip off the dummy and are letting him self wean). Oh that’s really good to hear – and how bizare that they had the same strange name for it! Don’t sweat it. As long as it’s not stopping her from communicating, I’m sure it’s doing her more good (as in settled) than harm and she won’t always have it. Enjoy the comfort ‘minna’ brings while it lasts! Thanks Tarnya, that is exactly the kind of thing I was hoping to hear! 🙂 I have just been hoping that there would come a day when it wouldn’t be a struggle for her to be without it, ya know? I believe in making life as easy as possible for yourself 😛 Scarlett’s favourites are the Nuk brand ones too. And there is no fear on the communication front – she is a major chatterbox!! I just found your blog and love it. Thank you. 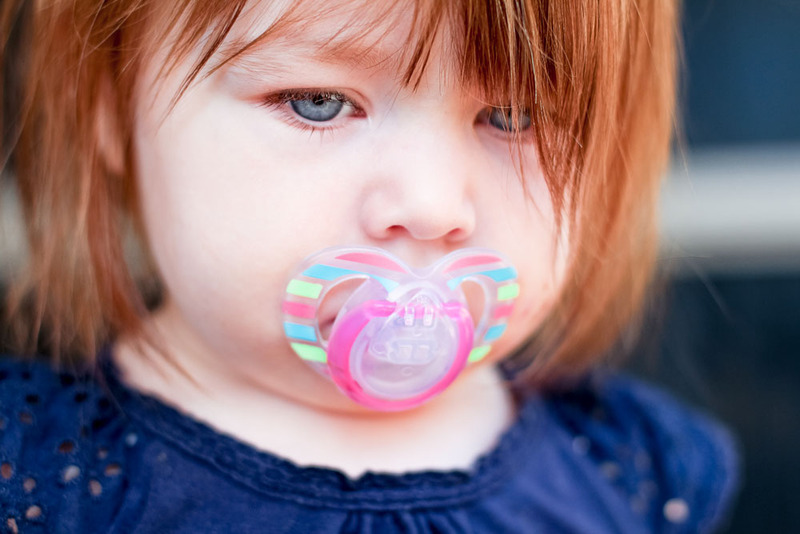 I just wanted to let you know that my daughter had a dummy til she was 5 years old. She gave it up on her on when she was ready. She is now 14 and has the most beautiful teeth and smile in the world. No orthodontic problems at all. 🙂 you little one is beautiful! God bless you all! Thank you so much Alexis! I’m so glad you’re enjoying my blog! And thank you for sharing your experience with your daughter, it really makes me feel better about my approach hearing things like that. Thank you!